Worked 14 years for the original Southwestern Bell Telephone Company. Had a couple of short term secretarial jobs, then got to stay home with youngest child from when he was 4-12 yrs old. Then I went to work at Stephen F Austin State University as a Library Serials/Binding Assistant. I worked there 19 years and chose to retire in 2011. My husband Dennis and I have been together for 43 years in May 2018---and hopefully many, many more. 1962 graduate. I enjoyed playing softball, volleyball, and basketball. I also enjoyed singing in the A Capella choir, and being part of the Madrigal Singers. I enjoyed being in the Pep Squad. (I was actually, pretty much, a loner (and am still a loner today). I wanted to be a female coach, but since there were almost no female coaches back then, I decided I'd be a P.E. teacher. Well, in college I never could pass History, so I changed my mind and took business courses (typing, shorthand dictation and transcription, business machines)....guess what??? None of those classes are any good anymore....But back then high school and college was always fun and enjoyable. And I was skinny. I've since gained 100 pounds, so there will be no "current" picture. 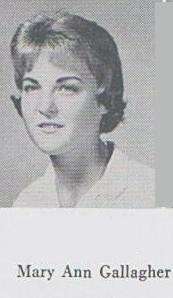 My absolute best friend from Sundeen Jr. High/Mary Carroll High School was Joetta Rosson (MCHS '62). She had cancer of the liver, colon, and ovary when she died September 4, 1987. I still stay in contact with her kids. I think of her often and miss her dearly. Mary Anne Gallagher Wilcox '62 updated profile. View.